In the remote Everest region of Nepal, seven out of ten girls drop out of school after grade 10. Other than for reasons of poverty, the prevailing cultural view in Nepal favors sending boys to school and keeping the girls at home to take care of household chores. As a result, the literacy rate of women is just 23%. At The Small World, we envision a world where every girl and boy has equal access and opportunity to attend school and receive an education. To realize this dream, and to end the gender gap in education in remote villages of Solukhumbhu, we built the first of its kind Girls' Dorm for higher education. This provides guardianship for girls to have a safe place as well as tuition fees, uniforms, and books. Several Women's Leadership Programs help them to push their personal limits with a goal of future role model leadership for their community. This helps to assure both girls and women and future generations that girls also can be teachers, doctors, leaders, social workers, successful business women, or anything they can dream of for their future. We had 160 girls graduate in 2016, and 20 more are graduating in 2017. Twenty-seven percent (27%) of all the graduates are placed in different jobs like teaching, health care, and accountancy. 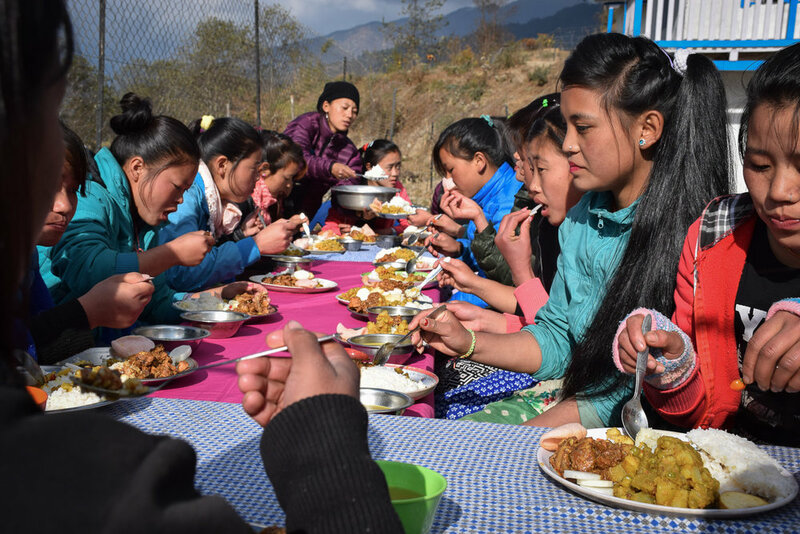 Every year, we support forty (40) girls who reside in some of the most remote villages in Solukhumbu for a higher education program in the Girls’ Dorm. It is our belief that change begins with these girls as they become role and leadership models for their communities and realize their dreams. we strongly believe the investment we together making on girls education is best investment to breakdown the poverty because better educated women tend to be healthier, participate more in the formal labor market, earn higher incomes, have fewer children, marry at a later age, and enable better health care and education for their children, should they choose to become mothers. All these factors combined can help uplift households, communities, and nations out of poverty. It’s family style living at the Girls’ Dorm, with each of the bedrooms shared by five of the girls. They cook together, eat together, and share with and care for each other as a close knit family. Among these girls, you will find diverse backgrounds, languages, and religious beliefs and practices, because we select girls from many different areas rather than just a couple of areas. We really favor this dynamic mix of backgrounds for teenage girls living together. Besides receiving a formal education, which is most important, they are learning many valuable lessons about life, such as living in harmony in a community with very diverse personal, cultural, and religious perspectives. It fosters wide-ranging dialogue, working together to solve problems, finding agreeable solutions, and tolerance and understanding of other people and their ways of living. Here the girls study together and help each other with their homework. The amazing sisterhood these girls share together generates a lot of happy times, and they love to dance and sing together, play volleyball, and just have fun, which all help to form strong bonds of friendship and family. Our girls are from various remote regions of Nepal where there is no opportunity for higher education and little hope for their future. Each girl that is selected for this program has to pass an Entrance Exam to qualify for college. This program enables our girls to continue their education, which is important, because only a higher education can facilitate their getting a better job, earning respect, and giving back to their community. Our Girls’ Education also offers computer education, which is an essential skill in today’s world, as well as familiarizing the girls with global society and technology. The girls also grow their own vegetables in the kitchen garden, which is part of their education for future farming in their community and also ensures valuable knowledge of agriculture and nutritious foods for their families and communities. A common occurrence in remote areas is that when parents do educate their daughters through Grade 10, they expect them to get a job and reward what they consider a sacrifice. Since they have no education themselves, ten years seems like an enormous amount of time. However, the reality in Nepal is that just a high school education (an SLC certificate) offers little or no qualifications for the job force, and the girls are not able to find work. Much conflict and anger results in families over this issue, especially with the mother, which causes the girls, under pressure, to marry early or, worse, succumb to the lure of traffickers to make money. In fact, girls of 16 are even more vulnerable to the dangers of trafficking for this reason. At the Dorm, everyone is taught the realities of international trafficking, that is, its operation, how someone is lured into trafficking, examples of real life stories and what really happens, and especially how to help prevent it, such as through mass media and documentaries. Another huge benefit is that the girls will return to their villages to educate the people, and especially girls, of the realities of trafficking. Our Women’s Leadership programs, which include women’s health education, is knowledge that will stay with these girls forever and which they will share to benefit their families and communities – one of the best and most ideal reasons to make an investment in girls’ education. Because of their enthusiasm and desire to make their dreams a reality, it is easy to envision these girls becoming future leading women of their community. Role models are important, so once a month we arrange meetings with inspiring female leaders, such as female teachers, nurses, business women, police officers, social workers, etc. We would like to give a huge thanks to all our partners, supporters, and volunteers who have been helping to make this a most renowned program, because the Solukhumbu Girls’ Dorm is the one and only, first of its kind program in the district of Solukhumbu! In fact, since 2010,140 girls have graduated from this program. Over 25% of the girls are already gainfully employed – teaching in villages, nursing, or managing their own small business. This project has been enormously successful and we are encouraged by that to help it grow even more and educate many more girls to bring very positive change to their lives, that of their families, their communities, and the country of Nepal!